I talk a lot here about the things I screw up. And rightly so - it is the basic premise for this whole blog, after all, plus there's a lot of material to work with there. But today I'm going to try something a little different - I'm going to sit here at my computer and stare at the screen until I think of ten positive, upbeat things to share with you about myself. Okay, okay, I'm ready now. Here we go. I once swerved to avoid running over a snake and I'm pretty sure I missed him, though it's hard to tell with snakes so I couldn't swear to it. I usually remember to turn the mixer off before I let the children lick the beaters. I never judge people, unless I'm better than they are. I push loose carts in the parking lot into the corral. Okay, just the carts that are right by my car, but still, that counts. I rarely smack anyone upside the head, even though a lot of people are asking for it. I limit myself to no more than 4500 calories per day, only 82% of which come from chocolate and chocolate derivatives, because I think modeling realistic eating habits is an important part of parenting. Related: I've saved my family hundreds of dollars by refusing to buy pants in a bigger size, despite the fact that the waistbands in my current wardrobe cut off the circulation to my feet. I volunteered to provide a snacks for my kid's classroom in January, and as of today I haven't yet developed a plan for backing out of it. I make every effort to only curse under my breath while attempting to brush the tangles out of my daughter's hair, clip the squirming baby's microscopic fingernails, or help anyone with their homework. I have awesome kids. I know this list is supposed to be about my greatness, but I take a lot credit for their awesomeness which makes me awesome by proxy. You guessed it, this list topic is once again brought to you by Stasha's Monday Listicles at The Good Life. Click the banner below to say you love me, then click the link to Stasha and read more lists about great (or "great") bloggers like me. Number 9 is truly impressive. Next time I find myself in such a situation, I will think of you and aspire to do better. It isn't easy. Rhyming words help, but aren't as satisfying - sometimes you just have to grit your teeth and try to make the stream of obscenities sound like you're whistling. Love the list, especially "I never judge people, unless I'm better than they are." That's a CLASSIC!! It doesn't come up much, but when it does I try to be as immature and petty about it as possible. You are WAY better than most people at almost everything you do. Maybe that's because you're uber awesome, or maybe it's because you rarely do things you aren't good at (jujitsu?). The math turns out the same either way. I think it's because I hardly ever do anything, and because your standards are low. You forgot #11 which is: Your blog almost always brings a smile to my face, no matter how sucky my day has been. Keep up the good work! #4: yes it DOES count...at least to me! And I agree with Tired Momma...you should have put in #11. Agreed. It would have been very Spinal Tap-y of you to include an 11th in your 10 reasons. I think we are all about #3! Awesome list. I may have to use it as inspiration for one of my own! #1 is true for me, too. The other day, I swerved and braked to avoid hitting three birds on the the road that just refused to fly away as my car approached. They finally did fly out of the way, thankfully, and I could rest easy knowing that I had done my best for wildlife. Wildlife had better send you a pretty impressive thank you note - or at least agree not to sit over your parked car this summer to do their "business." I'm nothing if not a health fanatic. Oh no wait, not health - I meant chocolate fanatic. I loved the mixers one. What a fab-tastic list! I loved it. Under your breath??? I will have to master that. Oh cutting infant nails was easy I simply bit them off. I know redneck I am. Coming by from Stasha's place. Thanks for the Monday laugh I sure needed it..
That's what I did with my first baby, because that's what the nurse told me to do! Then somebody looked at me like I was insane so I stopped - I don't really let crazy looks bother me anymore, I should go back to chewing the nails off. :) Thanks so much for being here! #8 is me all over...with anything I volunteer to make! If you think of something good let me know I have a snack I need to back out of providing. I have a feeling they're probably going to call me up and tell me not to bother, especially since I accidentally snort-laughed when the teacher recited the allergy list. I think I'm going to have to take them a bowl of white rice and some distilled tap water. I agree, we should take credit for our kids' awesomeness! Thank you for 6 & 7! I knew there was a way to explain that to myself! #5...high five on that one. way up high - because so so many are just asking for it. truly, we are saints. That's what I'm sayin', sister - if only people would give us credit for the incredible restraint we show on a daily basis. I totally love you for putting those carts back in the corral. Nothing pisses me off than those people who park it in an entire parking spot. On the ceiling??? No thank you. I'd have to move. You are awesome at making lists that make me laugh. #3, #4, #6 & #7 are my faves. I am a returner of shopping carts too! Oh NOOOOOO! That's grounds for getting triple your money back. Plus a coupon for Dairy Queen. Thanks though, this just reinforces my current plan of doing nothing, which is my favorite. Well, I can't say that I blame you. Though I have a soft spot for them because every time I think of snakes, I think of this time at the zoo when some little kid was nervous about petting a GIGANTIC snake we were holding (it took 4 of us to hold him) and one of the keepers said, "Don't worry kid, he won't hurt you." Then as the kid came closer, she finished, "He already ate a boy your size this morning." Priceless. Still makes me laugh. What do you mean, we're supplying snacks in January? Like, every day? 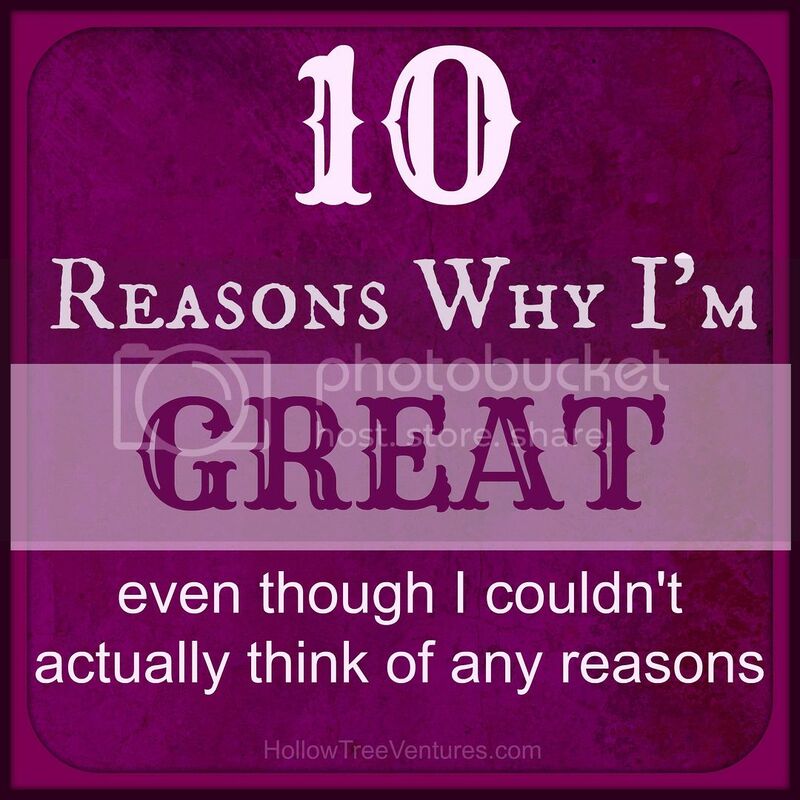 You could have added an 11th reason like the ladies above pointed out, but you could also have added a 12th, which would mention how you must be great, because your husband is awesome. Or at least he SEEMS awesome. And I hear he's awesome. And he smells awesome. Man, if you love my husband so much, why don't you marry him? Or at least his wife? And no, it's just one stinking day in January, but I'm already dreading it because I'm exactly that lazy and socially awkward and lazy. So you're supposed to turn the mixer off!! That's what I've been doing wrong all these years! LOL! So funny! I was laughing right away! The comment about the kids being fast enough lickers has me in tears! The visual.... Love as always, Robyn! PS, yes a #11 is in order for making us laugh - every. single. time. !!!! 97% does sound a lot more accurate! Thanks, as always, for linking up everyone's lists!